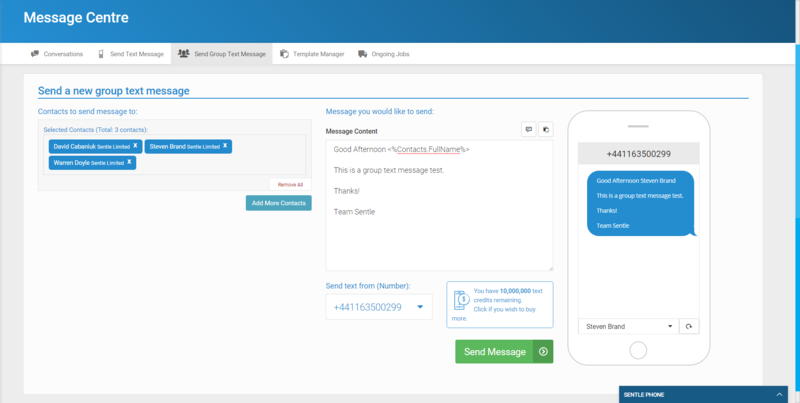 Sentle allows you to send the same message to a group of contacts via functionality located within the Message Centre. Select the ‘Send Group Text Message’ tab form where you will be given the option of sending to a contact group via data tags or via searching for specific contacts. The screen will look like this with the large button options available to select by clicking on either. Select the left hand button 'Send a Group Message to Specific Tag/s' to send a message via tags. The screen below will be displayed where you can select individual, single or all tags by checking the boxes next to them. As you select tags, the contact count next to the tag list will update to show you how many contacts in total the message will be sent to. You can now edit your message as normal or use a template before sending or scheduling to be sent at a later date. Start typing a contact name or select 'add contacts' to add contacts to the message. You'll be presented the familiar contact search window from which you can select and and add contacts to the message. 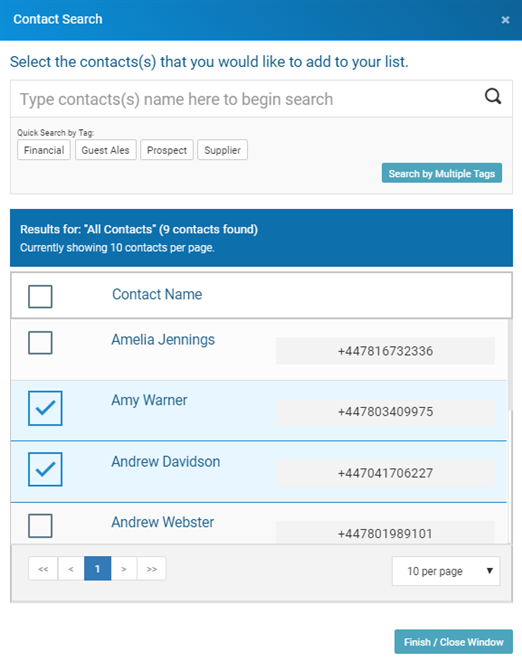 Searching for multiple contacts follows the same process of searching for a single contact with the added ability to select all (using the top check box) or to select individual contacts by selecting the check box next to each contact. 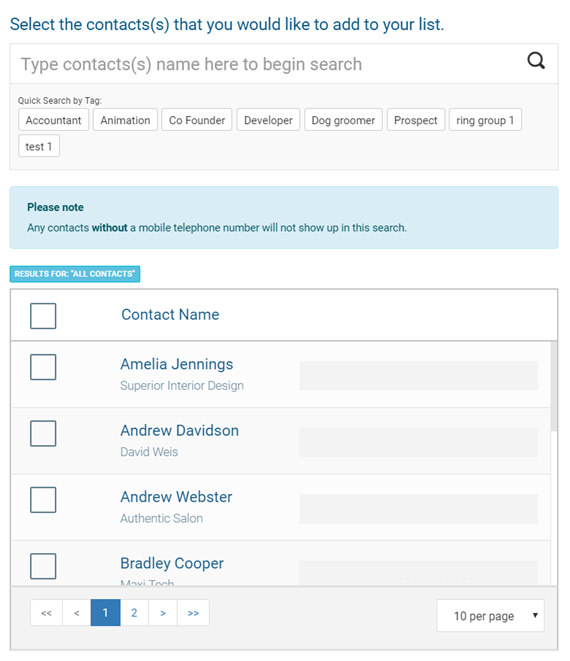 All contacts will be displayed here by default with you able to focus the list via single contact search, search by tag or by simply selecting via checkbox. When happy with your selected group click the green 'Finish/Close Window' button at the bottom of the window then close to be taken back into the main message centre view. Whether you have selected to send a single or a group message, following the previous steps will lead you to the message edit screen as shown here. There are a number of features available to you within this screen that are detailed below. Clicking ‘add more contacts’ will take you back through the steps detailed in pages 2 and 3 of this guide where you are able to edit which contacts you are sending the message to. This is where you can either free type a new message or select one of the pre-configured message templates within the system to use to send out to the group. When sending a group message to multiple recipients you are able to make sure the text message is personalised for each of your contacts by using the contact data fields that are available via the speech icon at the top of the message content screen. Selecting this activates a drop down menu from which you can choose which element of personal contact data you wish to display in the text. 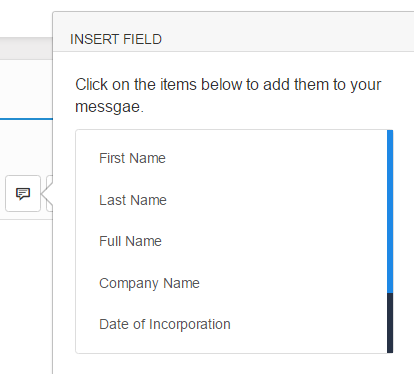 These will include standard data fields and any custom fields you have created in Sentle yourself. 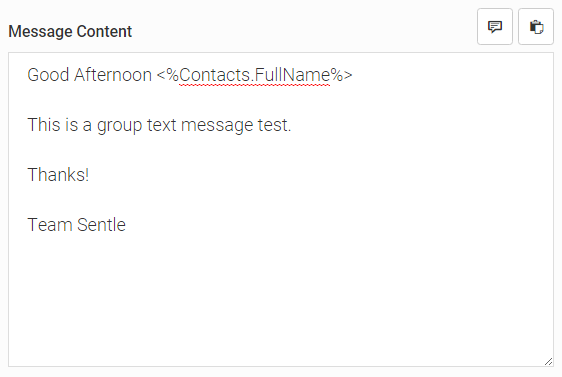 In the example below the Contact Data Field for ‘Full Name’ was used and this is how it will show up in the Message Content window. We’ve added a message preview within the mobile phone image so that you can see how the message will be delivered. Please note: When using data fields, messages will only be sent to those contacts that have the relevant data saved against their details. Select 'Send Message' to send the message to the chosen recipients. The resulting conversations and delivery statuses will be logged in the Message Centre.